For millions of people web sites are the major source of income. Thanks to the various ways to monetize a site, it is possible to make a living as a web master. However, this doesn't mean that every web master is a millionaire. Well, if you know how to monetize your web site, you might not get rich but at least chances are that under the worst possible scenario, you will be able to cover your hosting fees and the other expenses you make for your site. CPC ads (an abbreviation from Cost Per Click) are different from CPM because with CPC you get paid not when visitors view ads but when they click on them. The good news is that CPC rates are much, much better and as a result, it is possible to make a decent income even with a small site with not so high traffic. The key with CPC success is to have a well-targeted site in a niche where there are a lot of advertisers. The most popular CPC network is Google Adsense and even though there are other CPC networks, the income you can make from Adsense is much higher. The reason is that Google Adsense has many advertisers and if your site is in a profitable niche, CPC can be the best way to monetize your site. Additionally, unlike some of the other CPC ad networks, Google Adsense is open to publishers from all over the world. Usually CPC ads are text ads and you publish them in blocks. However, there are also intext ads, where the keyword is underlined and when the visitor puts the mouse on it, a tooltip with CPC ads appears. Intext ads are less obtrusive but it takes much more effort for the user to notice them (and above all – to click them), which means that your chances to make money are further decreased. Kontera is one of the most popular networks for intext CPC ads. The list of good CPC ad networks is not as long as the list of CPM or CPA ad networks but still there is a choice. For instance, Google Adsense, Yahoo! Publisher Network (YPN), BidVertiser, Chitika, and Clicksor are generally considered top choices but since many CPM ad networks pay decent rates for clicks on their CPM ads, you might want to try them as well. Currently CPA (an abbreviation from Cost Per Action) is the most profitable way to monetize a site in a profitable niche. CPA, also known as “affiliate programs”, pays you a commission when your visitors perform an action. Most often this action is a purchase, but it could also be something else – i.e. download a free trial, or signup for the service of the advertiser. 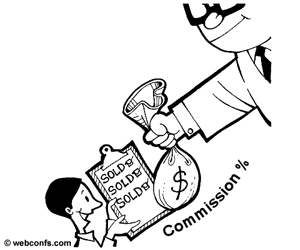 Affiliate programs can make you rich because there are many products with really fat commissions. For niches such as health, finance, travel, etc. affiliate programs are a real golden mine. However, affiliate programs require a lot of efforts on your side and still there is no guarantee that the offers you pick to promote will convert well and will make you money. Sometimes even the highest converting offers won't convert on your site and the only thing you can do is replace them with other offers, hoping that they will convert better. 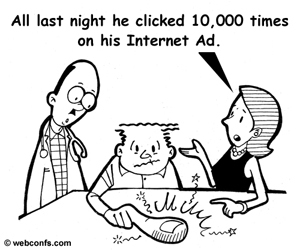 There might be hundreds of CPM ad networks but for CPA they are thousands. It is practically impossible to try all of them personally and this is why we would like to recommend some of the best to start with. Amazon, eBay, ShareASale, Commission Junction, Clickbank, Max Bounty, Azoogle, Never Blue Ads, LinkShare, or PepperJam are just a few of the greatest CPA networks we can recommend. If you are not happy with the CPM rates of ad networks, or CPC and CPA don't convert well with your site, you could try to find direct advertisers. However, have in mind that such an endeavor is not necessarily bound to succeed and if your site doesn't have audience advertisers can't reach elsewhere, you will hardly be able to negotiate good prices. Still, for some sites direct sales of ad space are a viable alternative and this is why you could also try it. Openads Ad Server and OIO Publisher Ad Platform are two of the sites where you could try your luck. AdBrite also allowa you to price your ad space. In fact, almost any major network gives you the chance to put a widget on your site to invite advertisers directly to advertise on your site. In addition to CPA ads, where you are selling other merchants' products, you can try selling your own merchandise or products/services with your brand. This technique works well mainly for popular sites with loyal audience and is hardly the easiest way to monetize a site. You could try to sell merchandise/goods/services as a supplementary service and if you see that this monetization technique works, you can expand the business. CafePress is one of the best places where you can sell merchandise with your logo and the greatest thing is that they print on demand, which means you don't have to keep your merchandise in stock. The monetization techniques we described here can be combined. 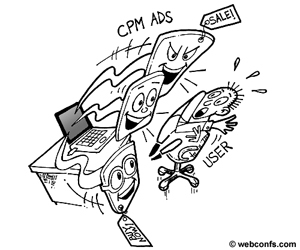 You can run CPM ads together with CPA or CPC. You can also combine multiple ads from the same type (i.e. CPM, CPC, or CPA) from different ad networks, provided that this doesn't violate the terms of these networks. There isn't a universal prescription about the best way to monetize a site. The basic rule is that you need to try and see what works for you. The fact that a given monetization technique works for somebody else doesn't mean that it will work for you, so you need to try and see for yourself.